These last few weeks of the dry season seem to attract far more scorpions than normal into the open, where they can be seen. The greatly feared scorpions leave their hiding places under rocks and in other dark places to search for water and food. While the prehistoric-looking beasties certainly aren’t the most attractive creatures on earth, it is their sting, not their lack of beauty that creates fear. 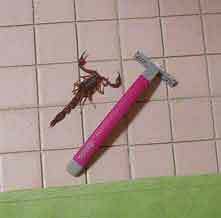 A scorpion sting can cause mild to extreme pain, or occasionally, death. The severity of the reaction is determined by the scorpion species, the body mass of the victim, the amount of venom injected, and the person stung. At lakeside, there are two families of scorpions – Buthidae and Vaejovindae. In Mexico, the genus Buthidae is called Centruroides; northern Mexico has some within this genus that are very dangerous. At Lake Chapala the centruroides infamatus or centruroides elegans are much less dangerous. The other local family of scorpions here is Vaejovindae and its many species of the genus vaejovis. Most people cannot identify local scorpions. They have more similarities than differences. However, generally the more poisonous scorpions have smaller pincers that have less muscle force, and therefore are given a more venomous toxin in order to kill its prey in the wild. The species of Centruroides have slightly smaller pincers than Vaejovis, and thus a stronger toxin. The good news is that if you are stung here, statistics show it most likely will be by a species of Vaejovis.